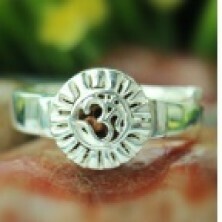 This elegant ring in pure silver designed with a 19-Mukhi Rudraksha is a perfect talisman with bhasma and metal of planet Mercury enclosed in tubes and beeja mantra of planet Mercury inscribed on its sides. 19 mukhi helps the wearer achieve all worldly pleasures. It bestows immense wealth, good health and success in business, beauty and prosperity. This Rudraksha is ruled by planet Mercury. It pacifies the malefics of Mercury in ones horoscope and increases its benefic. It is ruled by Lord Narayana. Rudraksha beads may be worn as necklaces, bracelets, rings or lockets. This 19-Mukhi Mercury planetary ring is convenient to wear and bestows you the grace of Lord Narayana.